A brand-spanking new poster for the Arrowverse's "Elseworlds" crossover just debuted, and it's opened up a whole lot of new questions in the process. Namely, is Lois Lane worthy? The new key art features a slew of characters that will appear in the event, including Clark Kent/Superman (Tyler Hoechlin) and Lois Lane (Elizabeth Tulloch). The latter can be seen holding an object which certainly seems to look like a hammer. So, what exactly is the hammer that she's holding? It's honestly hard to say, as there aren't really any clear DC Comics analogues for the object. Sure, DC characters like Harley Quinn and John Henry Irons/Steel wield hammers in the comics, but neither character has been expected to factor into the Arrowverse anytime soon, and that still wouldn't explain why Lois was holding that hammer anyway. If anything, the aesthetic of the hammer almost looks vaguely like something out of DC's New Gods, but that would open a whole other can of worms in the process. For one thing, DC currently has big-screen aspirations for the Jack Kirby group, and although the Arrowverse has arguably teased the world of the New Gods in the past, those hints ultimately haven't led anywhere. Even if the hammer did have a clear DC Comics counterpart, there's no telling exactly what this hammer has to do with "Elseworlds" as a whole, since the event will juggle so many cosmic elements. As the poster (and a recent post-credits scene) showcased, The Monitor (LaMonica Garrett) will play a major role in the event, which opens up a whole can of cosmic worms when it comes to DC canon. 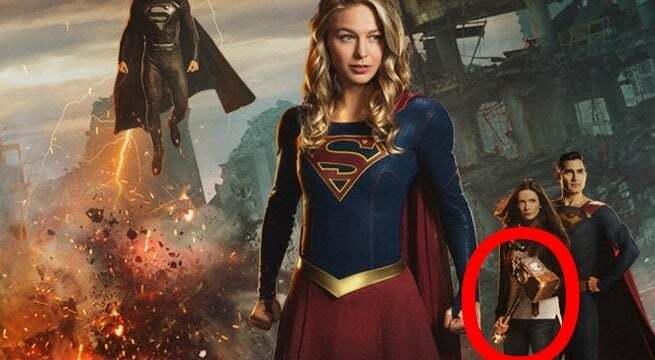 Either way, fans are pretty darn excited to see what "Elseworlds" has in store with Lois, who is set to make her Arrowverse debut.